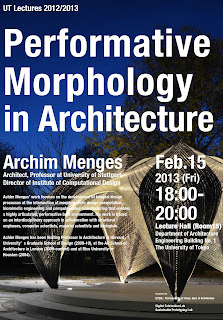 Achim Menges will lecture on 2/15. Achim will discuss his research work which focuses on the development of integral design processes at the intersection of morphogenetic design computation, biomimetic engineering and computer aided manufacturing that enables a highly articulated, performative built environment. His work is based on an interdisciplinary approach in collaboration with structural engineers, computer scientists, material scientists and biologists. Achim Menges has been Visiting Professor in Architecture at Harvard University’s Graduate School of Design (2009-10), at the AA School of Architecture in London (2009-current) and at Rice University in Houston (2004). Working with their 1:10 scale model, 1st year students are developing their pavilion design which will be constructed in August this year. 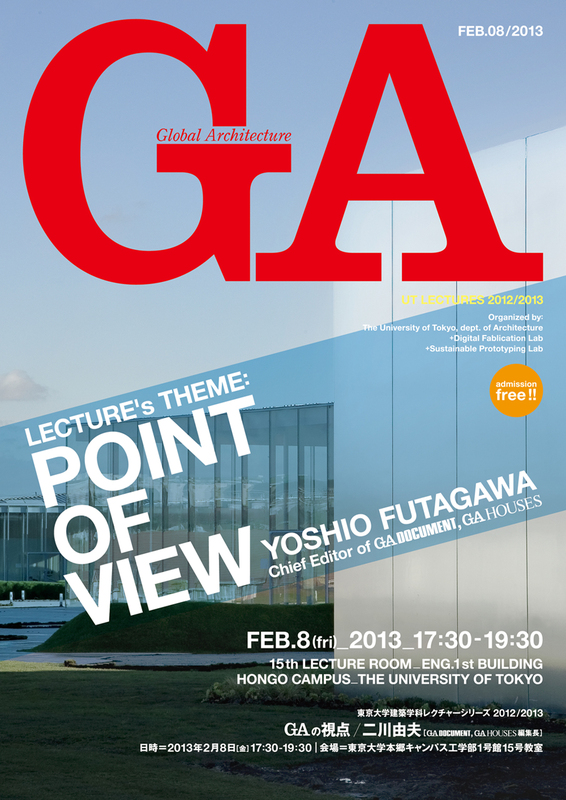 Yoshio Futagawa, chief editor of GA Document and GA Houese, will give a lecture titled, POINT OF VIEW. 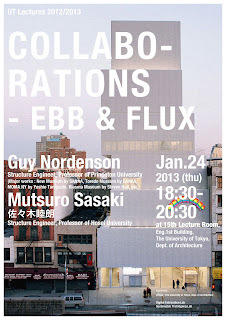 Joint lecture by Guy Nordenson and Mutsuro Sasaki. Guy Nordenson is a structural engineer and professor of architecture at Princeton University; Mutsuro Sasaki is a structural engineer and professor at Hosei University. Guy and Muturo worked with Japanese architects in the last decades, including Sanna, Toyo Ito, Arata Isozaki, and will be discussing their collaborative design processes. Aiming towards their final presentation and construction of 1:1 scale prototypes in August, 2nd year students are back in studio to develop their project on Cybernetic Urbanism.